As farms are getting larger there is less time for individual cow attention - during milking having access to the right information at the right time is essential. The Swiftflo Commander, the new brain of the milking parlour, controlling everything to do with milking, feeding and animal health has arrived! The launch at AgriScot created great excitement especially after having recently won 2 major awards at the leading agricultural show in Ireland, the National Ploughing Championships. It offers a new level of intelligence that takes command of each milking unit within the parlour. Data alone has no intrinsic value, it's what you do with the data that creates value. The Swiftflo Commander gives the producer a lot more information when and where it’s needed - at the cow milking point. Next generation touchpad technology means that it is extremely robust, easy to clean and fully water resistant. The Swiftflo Commander displays important information such as milk yield, milking time, and somatic cell count (SCC) data on each cow and much more. The intelligent unit uses smart pulsation for reduced wear and a longer life time. It can also display if your cow is in heat and sort that cow with a single touch for AI or further inspection. Imagine a system that can identify what each cow is contributing to your herd SCC? The Swiftflo Commander can display a cow’s percentage SCC of the entire herd. The advantage of having this information about each individual cow at the right time in the parlour is that you can act on it. It will also prompt the farmer to do a California Milk Test (CMT) when high SCC information is received so diagnosis and treatment is much sooner. The farmer can enter information directly from the milking point e.g. treatment dates, the smart technology then automatically retains milk until the withdrawal period is up and it is then safe for it to enter the milk tank again. It also indicates freshly calved cows that enter the parlour. It uses speech technology to inform farmers of information at a time when they can react to it. With more emphasis on hygiene and ever increasing milk quality standards the cleaning performance of each unit is also individually monitored. The Swiftflo Commander gives the farmer the capability and functionality of doing herd management at every single milking point in a very easy manner. When you invest in the Swiftflo Commander you are making the right investment for the future. It uses smart technology that allows all units to be updated within a few minutes. Previously when you bought a piece of technology e.g. a TV, it stays the same until the end of its lifetime, whereas today if you buy a smartphone you can download new apps within a few minutes. 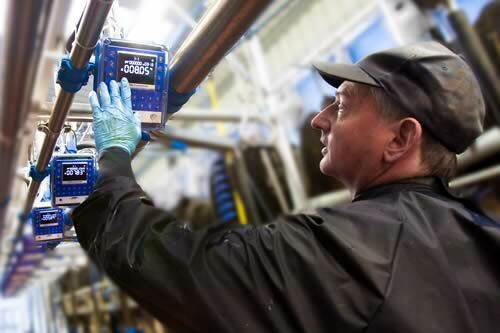 Dairymaster uses this smart technology to ensure that you have the latest features and capability into the future.